Receive Beamforming with Null Steering in the 802. 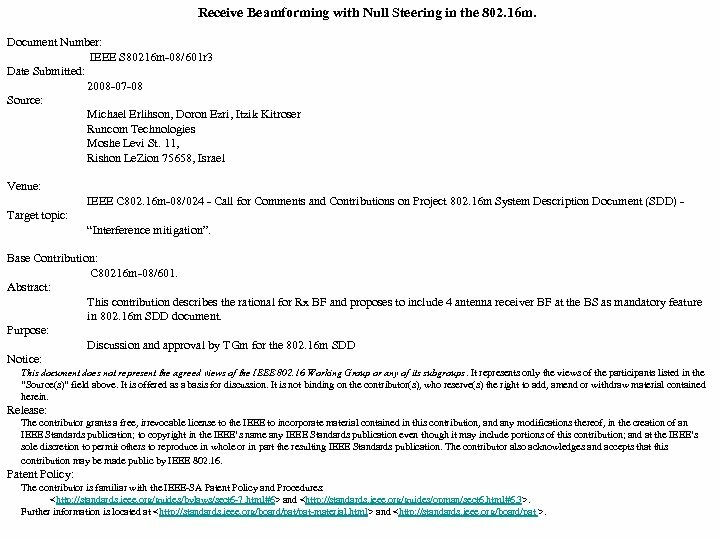 16 m. Document Number: IEEE S 80216 m-08/601 r 3 Date Submitted: 2008 -07 -08 Source: Michael Erlihson, Doron Ezri, Itzik Kitroser Runcom Technologies Moshe Levi St. 11, Rishon Le. Zion 75658, Israel Venue: IEEE C 802. 16 m-08/024 - Call for Comments and Contributions on Project 802. 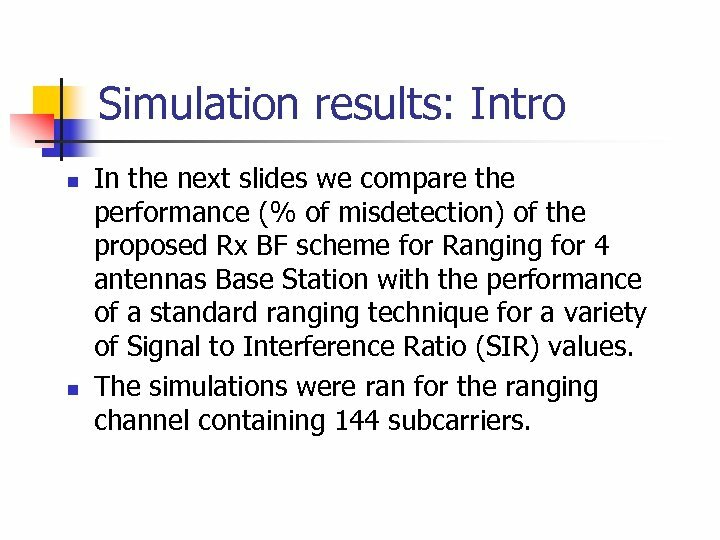 16 m System Description Document (SDD) Target topic: “Interference mitigation”. Base Contribution: C 80216 m-08/601. 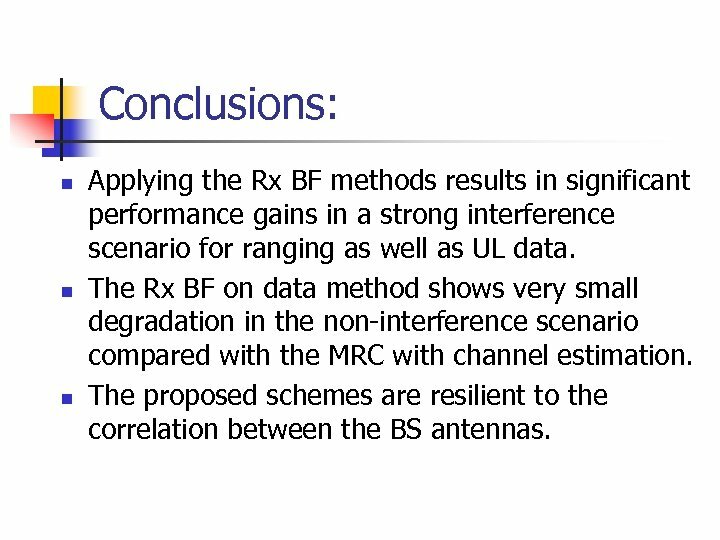 Abstract: This contribution describes the rational for Rx BF and proposes to include 4 antenna receiver BF at the BS as mandatory feature in 802. 16 m SDD document. Purpose: Discussion and approval by TGm for the 802. 16 m SDD Notice: This document does not represent the agreed views of the IEEE 802. 16 Working Group or any of its subgroups. It represents only the views of the participants listed in the “Source(s)” field above. It is offered as a basis for discussion. It is not binding on the contributor(s), who reserve(s) the right to add, amend or withdraw material contained herein. Release: The contributor grants a free, irrevocable license to the IEEE to incorporate material contained in this contribution, and any modifications thereof, in the creation of an IEEE Standards publication; to copyright in the IEEE’s name any IEEE Standards publication even though it may include portions of this contribution; and at the IEEE’s sole discretion to permit others to reproduce in whole or in part the resulting IEEE Standards publication. The contributor also acknowledges and accepts that this contribution may be made public by IEEE 802. 16. Patent Policy: The contributor is familiar with the IEEE-SA Patent Policy and Procedures: and . Further information is located at and . 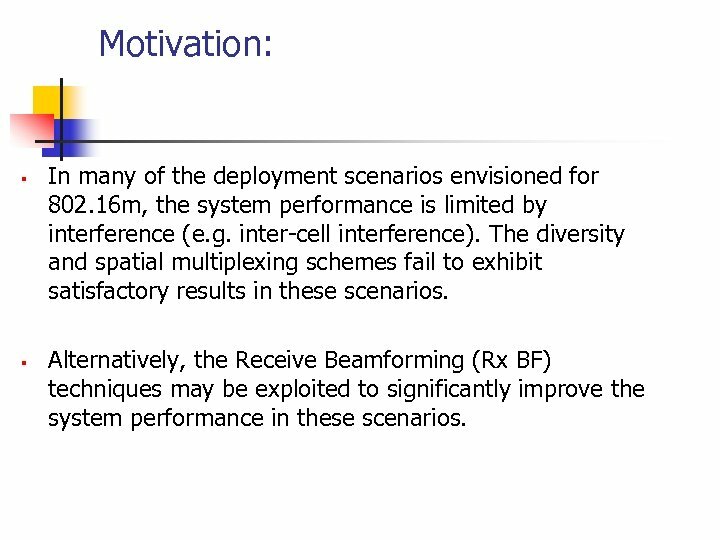 Motivation: § § In many of the deployment scenarios envisioned for 802. 16 m, the system performance is limited by interference (e. g. inter-cell interference). The diversity and spatial multiplexing schemes fail to exhibit satisfactory results in these scenarios. Alternatively, the Receive Beamforming (Rx BF) techniques may be exploited to significantly improve the system performance in these scenarios. 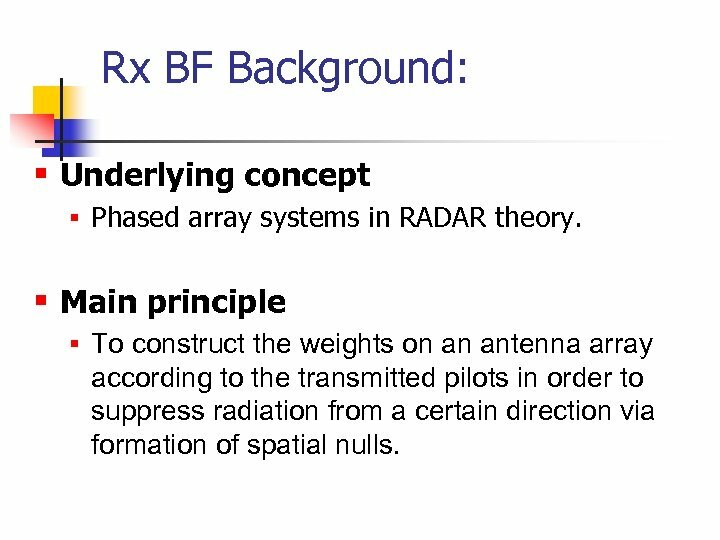 Rx BF Background: § Underlying concept § Phased array systems in RADAR theory. § Main principle § To construct the weights on an antenna array according to the transmitted pilots in order to suppress radiation from a certain direction via formation of spatial nulls. 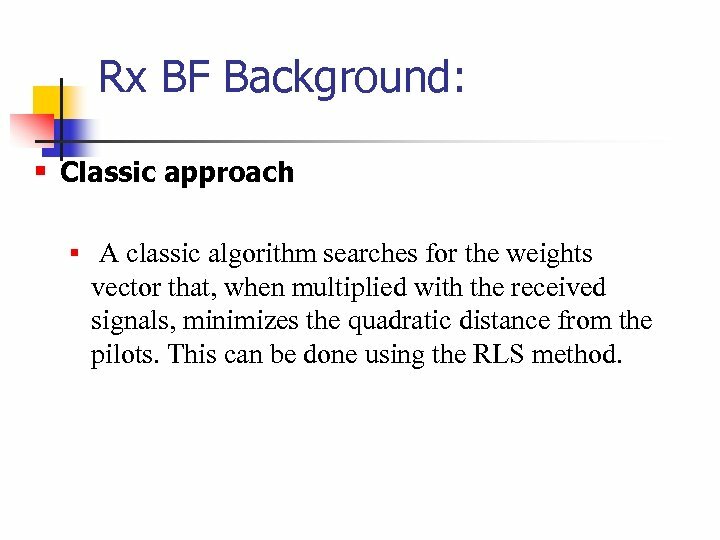 Rx BF Background: § Classic approach § A classic algorithm searches for the weights vector that, when multiplied with the received signals, minimizes the quadratic distance from the pilots. This can be done using the RLS method. 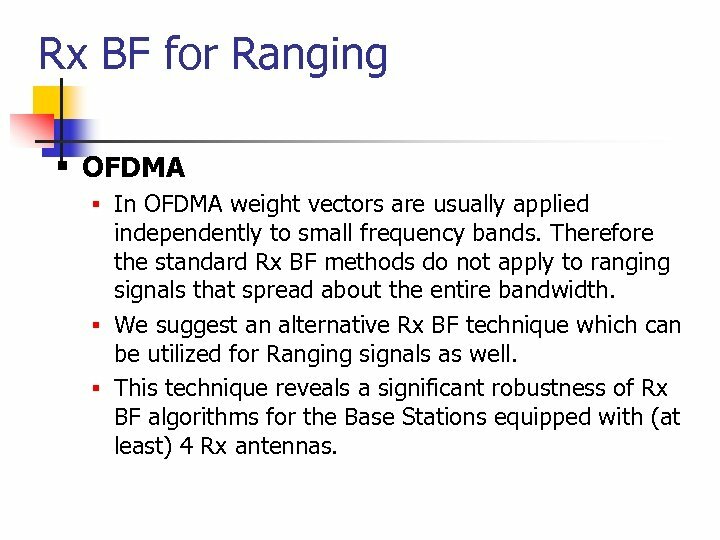 Rx BF for Ranging § OFDMA § In OFDMA weight vectors are usually applied independently to small frequency bands. 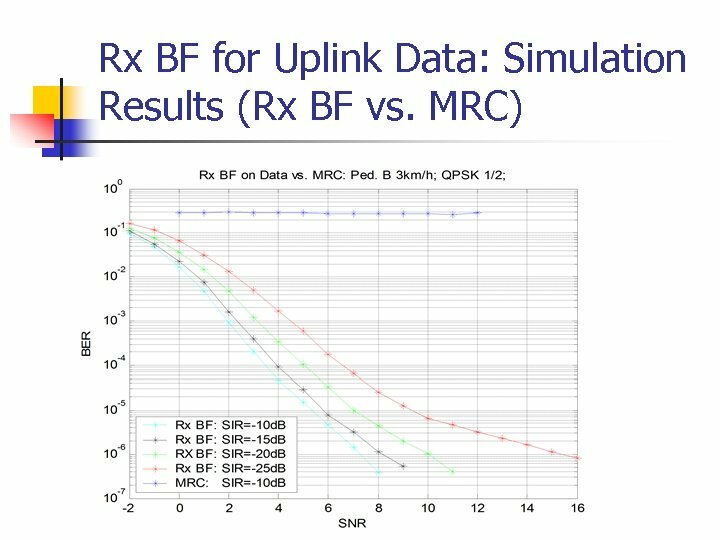 Therefore the standard Rx BF methods do not apply to ranging signals that spread about the entire bandwidth. 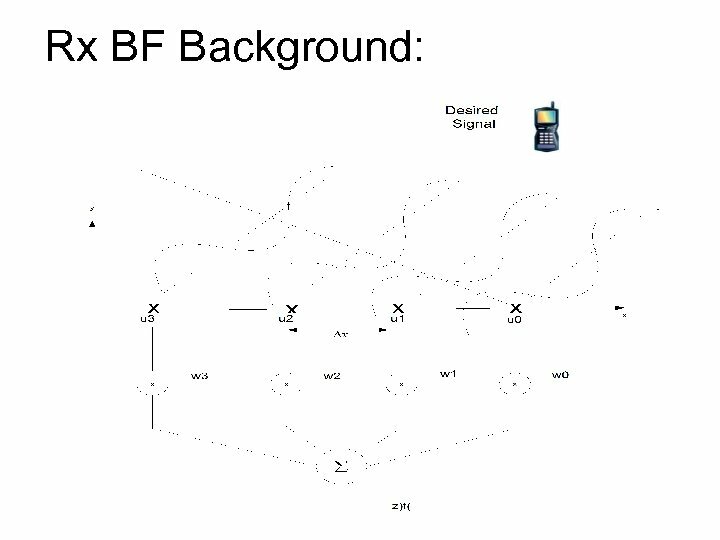 § We suggest an alternative Rx BF technique which can be utilized for Ranging signals as well. 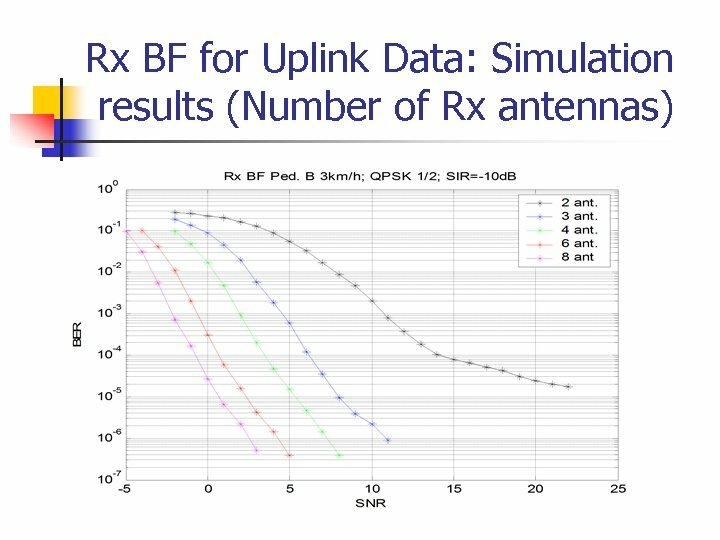 § This technique reveals a significant robustness of Rx BF algorithms for the Base Stations equipped with (at least) 4 Rx antennas. 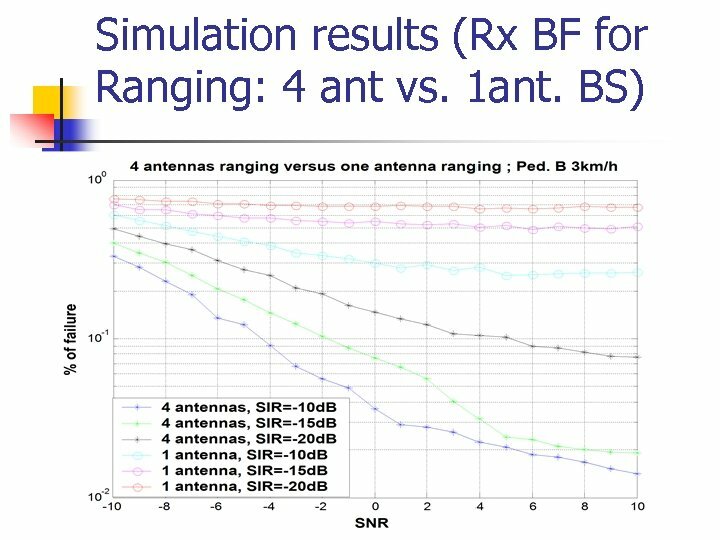 Simulation results: Intro n n In the next slides we compare the performance (% of misdetection) of the proposed Rx BF scheme for Ranging for 4 antennas Base Station with the performance of a standard ranging technique for a variety of Signal to Interference Ratio (SIR) values. The simulations were ran for the ranging channel containing 144 subcarriers. 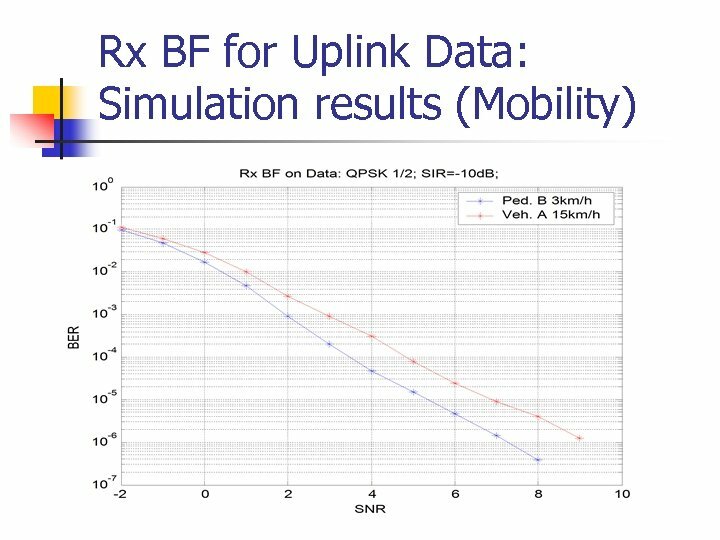 Rx BF for Uplink Data: General Parameters n PUSC w/o Subchannel rotation. 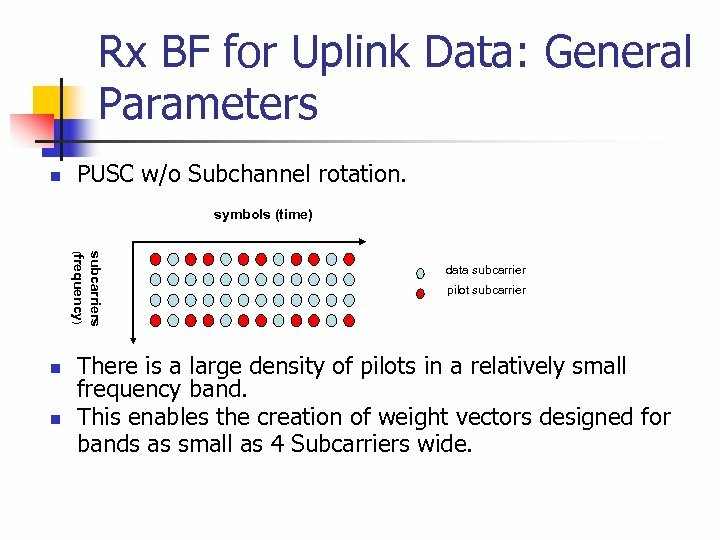 symbols (time) n subcarriers (frequency) n data subcarrier pilot subcarrier There is a large density of pilots in a relatively small frequency band. This enables the creation of weight vectors designed for bands as small as 4 Subcarriers wide. 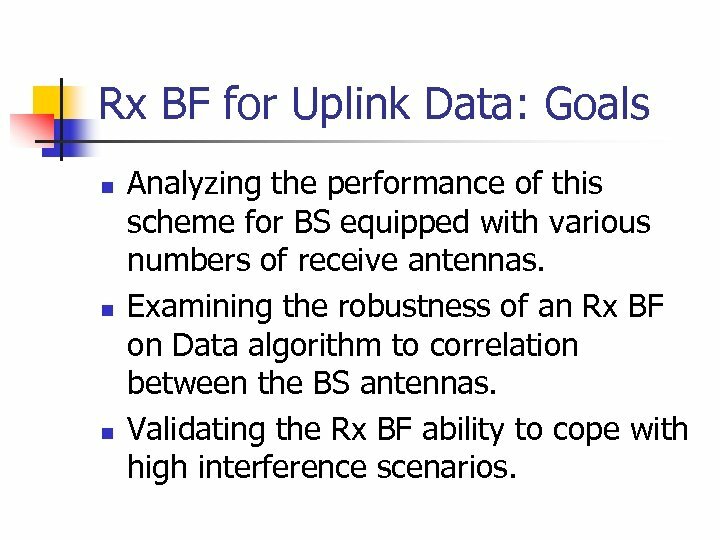 Rx BF for Uplink Data: Goals n n n Analyzing the performance of this scheme for BS equipped with various numbers of receive antennas. 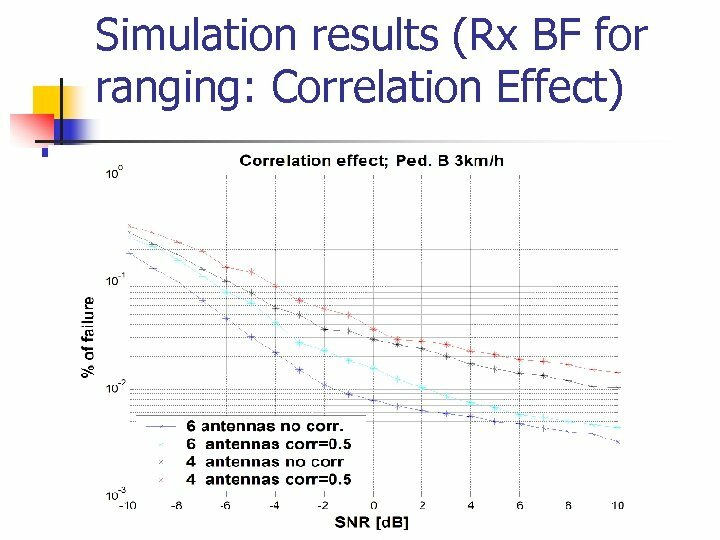 Examining the robustness of an Rx BF on Data algorithm to correlation between the BS antennas. 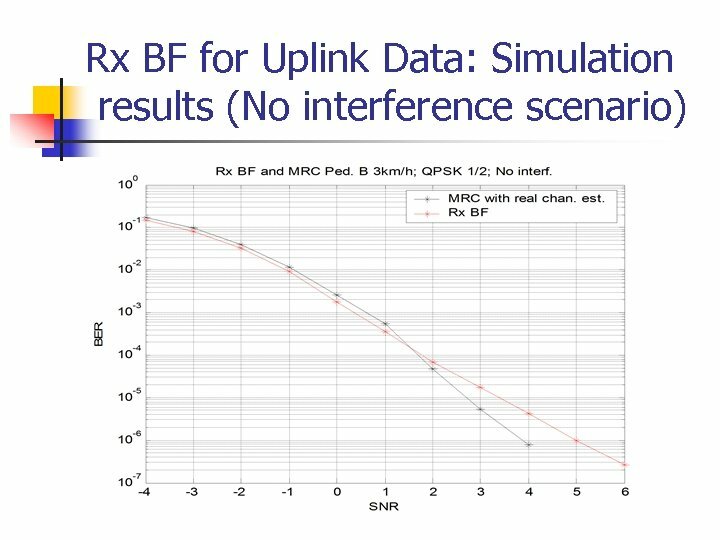 Validating the Rx BF ability to cope with high interference scenarios. 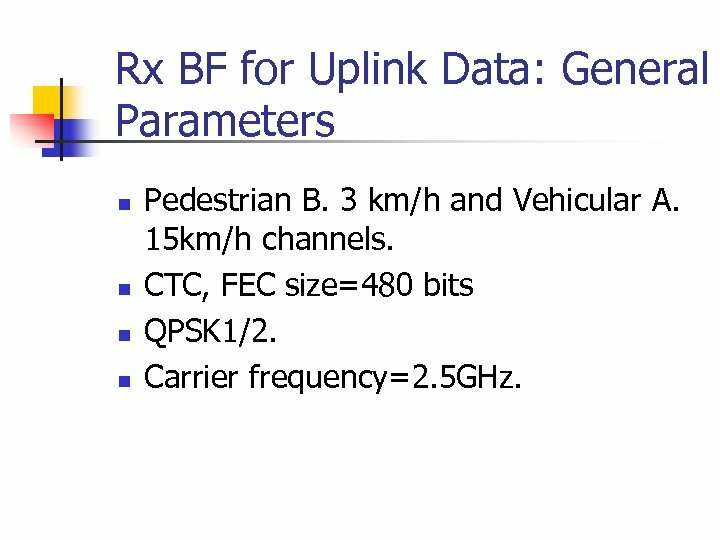 Rx BF for Uplink Data: General Parameters n n Pedestrian B. 3 km/h and Vehicular A. 15 km/h channels. CTC, FEC size=480 bits QPSK 1/2. Carrier frequency=2. 5 GHz. 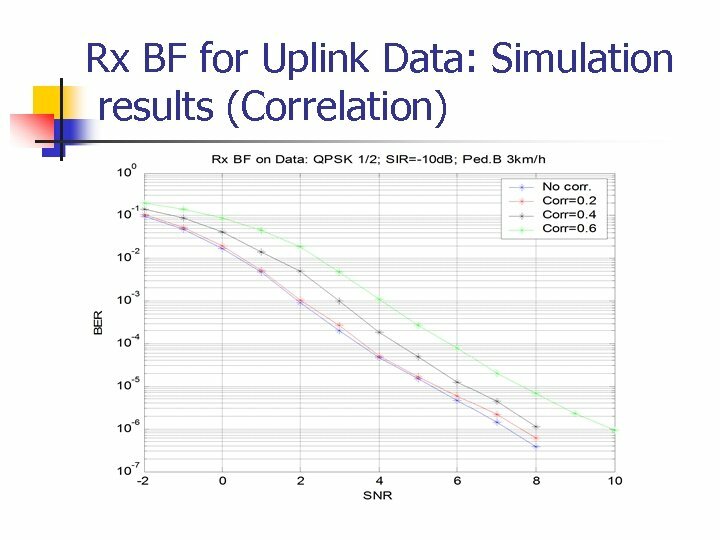 Conclusions: n n n Applying the Rx BF methods results in significant performance gains in a strong interference scenario for ranging as well as UL data. 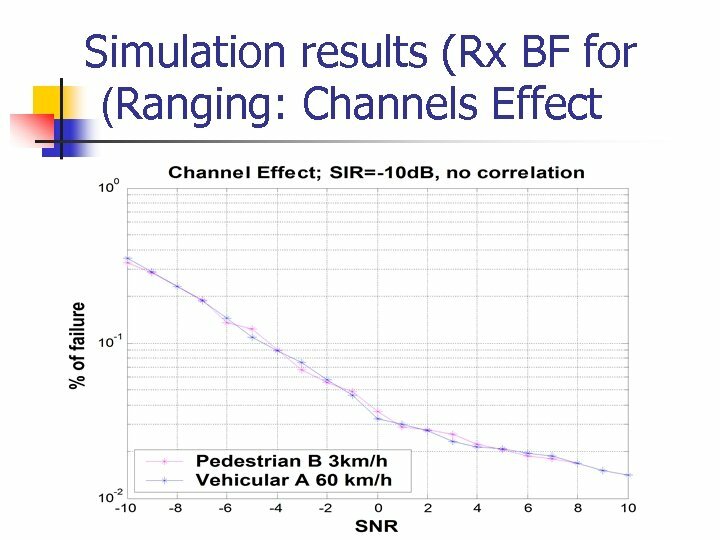 The Rx BF on data method shows very small degradation in the non-interference scenario compared with the MRC with channel estimation. The proposed schemes are resilient to the correlation between the BS antennas. : Proposed changes n n Include a Receiver Beamforming section in the SDD. The system shall support receiver beamforming techniques at the BS. 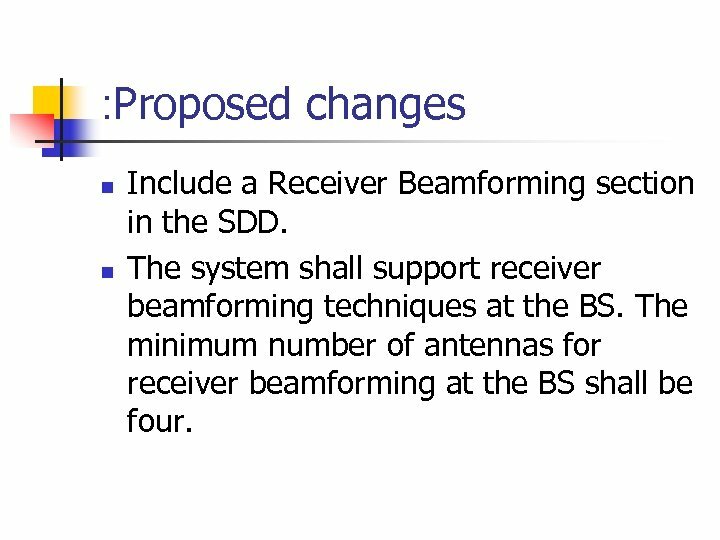 The minimum number of antennas for receiver beamforming at the BS shall be four.